Congratulations to Gretta Teets - She is the winner of the 2018 Leg-Up Raffle Foal, Tarantino d'Avalon (ES Toronto x Emmanuelle d'Avalon/Edelweiss de Bonce)! Tarantino d'Avalon will be moving to Texas! L.E.A.P. 's mission is to organize, develop, raise and distribute funds to help equestrians and equines suffering from catastrophic events, illness, accidents, injuries, to help those that find themselves in an untenable situations and/or to just pay it forward where we can!. Our goal is also to provide financial assistance for education, assistance and training for promising equestrians and/or their horses. We hope to raise awareness of those individuals that are in need and to help, where possible, with raising funds to assist with their immediate and long term needs. L.E.A.P. was developed out of a recognition that sometimes bad things happen to good people, and sometimes good people can use a little bit of assistance to realize their dream. Occasionally, we all could use a leg (or hand) up! The inspiration to start L.E.A.P. came about when one of our board members' father was dying. He had fallen and broken his hip and did not regain consciousness after surgery. They were, at that time, struggling just to pay bills. An airline ticket, on short notice in the middle of Spring Break was out of any realm of possibility. With the father living over 2,000 miles away, they recognized that driving would result in arriving too late to say goodbye. However, a close friend in the airline industry, was contacted in the hopes that they had some suggestions or inspiration that might make a flight a possibility. A text back with the message "You've got mail - check your email.". What was in the email? A fully paid round trip airline ticket. That board member was able to say one last goodbye to her father and will be forever grateful to the people that made that possible. We recognize that this is not a unique situation, but the giving nature and kindness extended is sometimes lost in our everyday busy lives. Being in an untenable situation with no options available is something that we hope to make a little less commonplace. We would like to be able to say that sometimes, there "is" another option. Fast forward a few years and with the memory of that heartbreaking time and the kindness of someone, Leg-Up Equestrian Assistance Program, Inc.- IRS 501(c)(3) - was established in order to be able to give back to an industry that is near and dear to all involved in this Foundation. In 2010, Avalon Equine, in conjunction with the Oklahoma Dressage Society, raffled off one of their Warmblood foals, Adieu d'Avalon and those funds were donated to the Courtney King-Dye Fund. 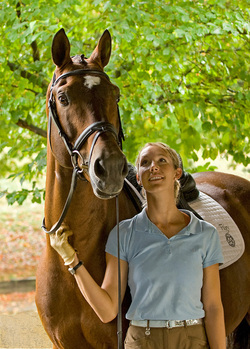 March 3, 2010 Olympic dressage rider, Courtney King-Dye, fell from a horse and suffered a traumatic head injury. The injury resulted in severe brain trauma and Courtney was in a coma for several weeks following the accident. Courtney has defied the odds and has not only regained consciousness, she is making miraculous progress and recently has even ridden a horse as part of her therapy. However, the costs associated with her medical care and rehabilitation are devastatingly high. The Oklahoma Dressage Society and Avalon Equine joined forces in an effort to raise funds to assist one of our own! Avalon covered all the costs associated with Adieu’s care, inspection and registration until the winning ticket holder was announced. The proceeds went to the Courtney King-Dye Trust. In 2011, Avalon Equine donated another Oldenburg foal to be raffled off by the Leg-Up Equestrian Assistance Program, Inc. The foal - Beetlejuice d'Avalon (Black Tie x Morticia/Mannhattan) - a chestnut, Oldenburg colt that was judged premium at his foal inspection. The proceeds from that raffle were donated to Colorado State University to help the graduate students that lost their research in the fire that destroyed Colorado State University's Equine Reproduction Lab. In 2012, Avalon Equine once again, generously donated the 2012 RPSI filly, Moulin Rouge d'Avalon (Mannhattan x Faberge'/Frohwind). A grey filly, her siblings set the bar for her. She was won by Marsha Byrum of North Carolina. We were able to use those funds to help Eddo Hoekstra - a young trainer that suffered a life changing stroke. We were also able to offer some assistance to Edward Hyde, a farrier that suffered with multiple myeloma. And, in 2013, Avalon Equine donated a full brother to the fully licensed and approved stallion, Edward Scissorhands d'Avalon. Elixir d'Avalon is by Escudo II and out of the full sister to last year's raffle full, Morticia (Mannhattan x Faberge/Frohwind). Elixir was the site champion at his inspection and Gold Premium! He is fully registered and branded. He was won by Stephanie Wendorff and is currently residing in Colorado with his new owner. This year, Avalon Equine has donated Gold Sovereign d'Avalon, a stunning buckskin warmblood colt by the Cremello Thoroughbred stallion, Goldmaker and out of Macy's Rainbow (Mannhattan x Delilah/Vosmaer). Goldmaker is currently the only Cremello Thoroughbred stallion in the world that has successfully completed a stallion performance testing and is fully licensed with a warmblood registry. Macy's Rainbow, while a career broodmare, her full sibling, Margo J, is competing at FEI level in Dressage. Someone is going to get a truly stunning colt this year! Please bear with us as this website and the corporation is a work in progress and built entirely by and with volunteer time and dedication! Below are a few photos of the raffle foals - past and present!